The Upper Deck Company announces the return of its landmark Exquisite Collection brand with the release of the 2004-05 NBA Exquisite Collection (MSRP $500) later this month. Last year, the critically acclaimed set revolutionized the collectibles category and put the rest of the industry on notice with its cast of top rookie autographs, and one of one logo man cards which further solidifies Upper Deck as the leader in the industry. In fact, many of the 2003-04 cards continue to sell for thousands of dollars on the secondary market. The 2005 edition continues to raise the bar with the inclusion of the printing plate cards featuring last year's hottest rookie, LeBron James (including autographed variations), triple logo man cards, and much more. "Last year's NBA Exquisite changed the way the industry thought about high-end collectible sets," said Director of Product Development, Joe Fallon. "With the 2004-05 Exquisite Collection Basketball, we are continuing to take the hobby to new heights." The 90-card set features a total of 42 NBA stars and 48 rookies appearing in action-packed, cutting-edge designs in which collectors have come to expect from Upper Deck. All the cards in the regular set are numbered to 225, with black and platinum sets numbered to 25 and one to add chase. A 48-card rookie subset features autographed and autographed patch cards from this years draft class such as Josh Smith, Ben Gordon, Andre Iguodala, Dwight Howard, and Sebastian Telfair. These highly collectible cards, which are all also serial numbered, have multiple parallel versions to add extra excitement for collectors. 2004-05 Exquisite Collection Basketball -- delivered in a dark cherry wood box -- offers collectors a wide range of unique, one-of-a-kind memorabilia, autograph and combination cards. Hobbyists will also have a chance to collect memorabilia from such themes as Extra Exquisite, Extra Exquisite Duals, Exquisite Triple Patches, Exquisite Quad Patches, and Exquisite Foursome, to name a few. In addition, they will be able to get their hands on incredible autographs in sets such as Autograph Exquisite Patches, Limited Logos and Dual Scripted Swatches. Variations of the inserts sets are sequentially numbered to various levels to add chase. The collection also include the All-NBA Access Pass Triple Logoman Patches insert cards. 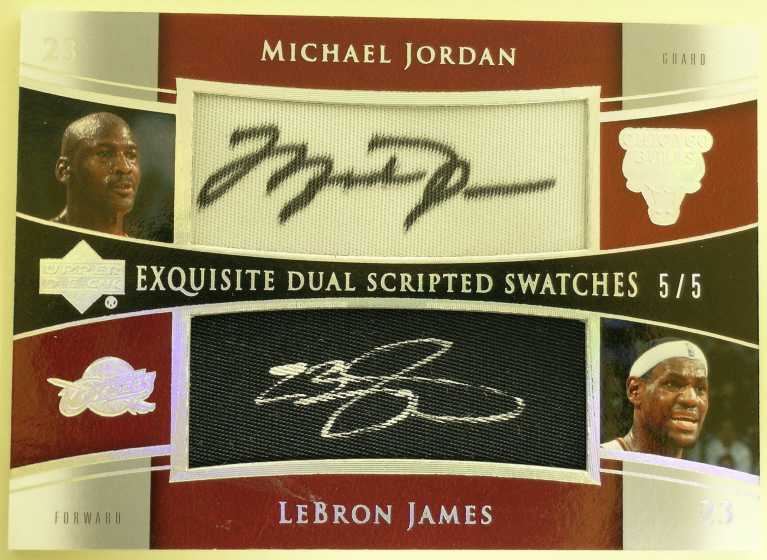 These one of one combination cards feature the NBA logo patches from the jerseys of superstars such as LeBron James, Kobe Bryant and Michael Jordan. Later this month, 2004-05 Exquisite Collection will hit hobby store shelves with a suggested retail price of $500 per pack. A sneak preview of the set will be shown to those who attend the Chicago Sportsfest June 24-26. 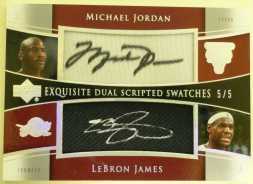 For complete product breakdown, visit www.upperdeck.com. Founded in 1988, The Upper Deck Co., LLC is a premier sports and entertainment publishing company that delivers a portfolio of relevant, innovative and multi-dimensional product experiences to collectors, sports and entertainment enthusiasts. For more information on Upper Deck or the company's products, please visit www.upperdeck.com.